The Vienna Philharmonic wishes to develop enthusiasm for music among young people by allowing them to participate in dialogue between great conductors and musicians and, by means of this personal contact, give them insight into the professional world of classical music. New forms of engaging in music accommodate the young peoples' needs. 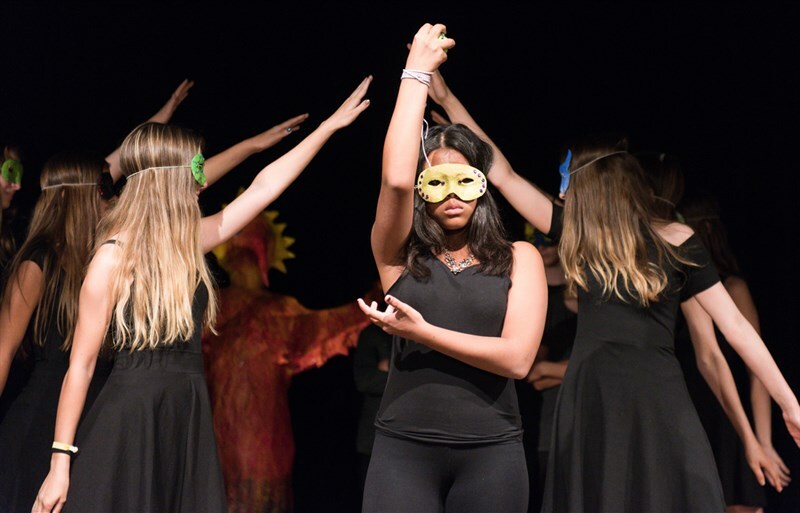 Emphasis is placed hereby on moderated and staged concerts, musical introductions of a pedagogical nature and workshops and projects with an inter-disciplinary character. By initiating creative processes, we pursue the goal of stimulating that element of understanding without which no art or appreciation thereof would be possible. Alle Musikvermittlungsprojekte im schulischen Bereich sind für die Teilnehmer kostenlos! 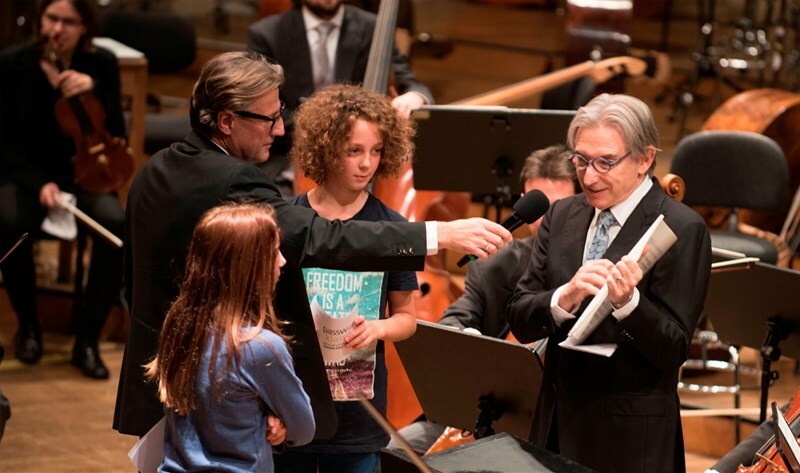 Here great orchestral music comes to life for young listeners. Compositions from the classical, romantic and modern eras are examined from various vantage points. Soloists, conductors and contemporary composers are involved and come in direct contact with their audiences. The moderated concerts are designed specially for the various educational levels. During an advance training session the teachers receive learning materials in order to prepare the students for the concert visit. Here students are able to experience musicians and their instruments first hand. Breath and emotion, technique of playing and passion - making music at the highest level, right in the class room! The colorful range of orchestral instruments sounds in small ensembles from trio to nonett. The various chamber music ensemble of the Vienna Philharmonic perform repertoire from the program cycle in the Vienna State Opera. The spectrum extends from the baroque all the way to the modern era. Encounters with lesser-known composers are guaranteed. The concerts will be accompanied by teacher training and teaching material. © Jun Keller ≡ Infopasswort:klassik | Klingende Konzerteinführung | + Zoom The students create together with orchestral musicians an up to date, lively examination of the piece. In doing so, they make use of themes and motives of the composition at hand and reflect and augment it with their own musical forms of expression. 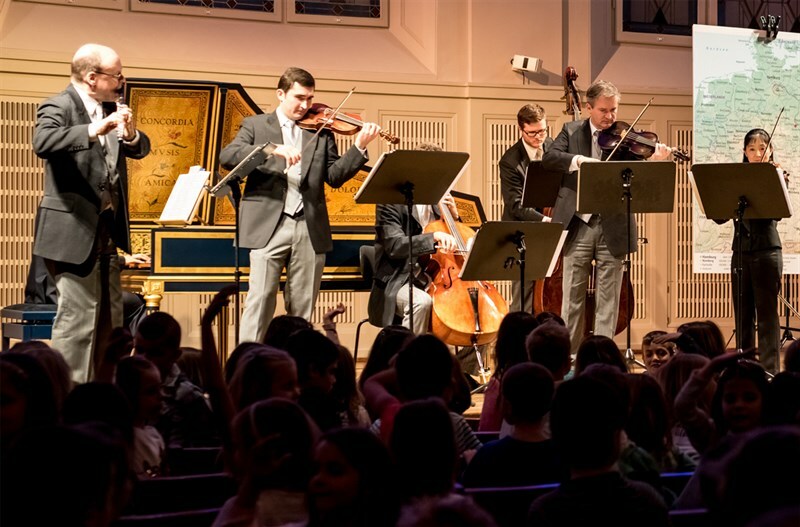 The results are presented before a subscription concert as "Klingende Konzerteinführungen". The interdisciplinary inclusion of other art forms infuses the presentation with the character of a performance. What was going through the conductor’s mind when he was writing this composition and what was his life like? Who was he working for and how far was he influenced by the political and historical setting of that time? These are interesting questions and if one wants to get familiar with a particular piece of music it is worth spending some time to investigate and answer them. In our classes, two (or more) groups investigate the same composition, approaching it from different perspectives. 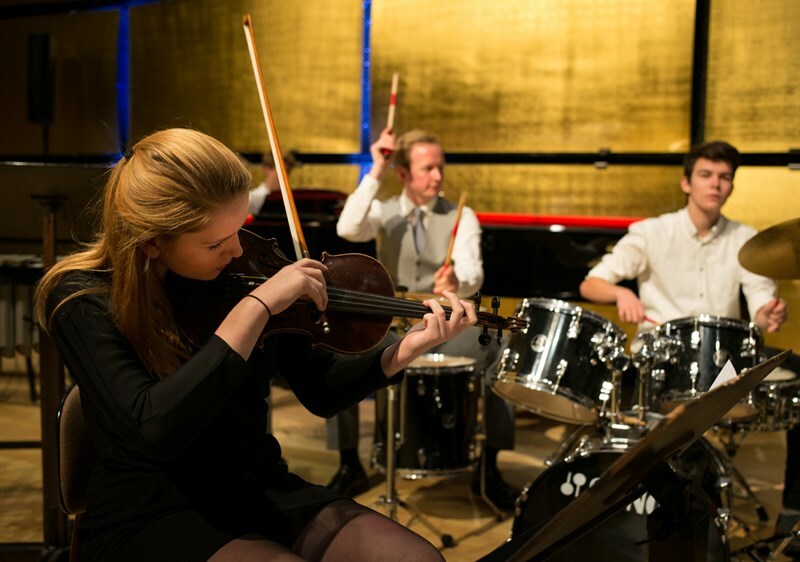 The findings will then be presented to each other and at the end of the workshop, both groups will be attending a rehearsal of the composition studied. 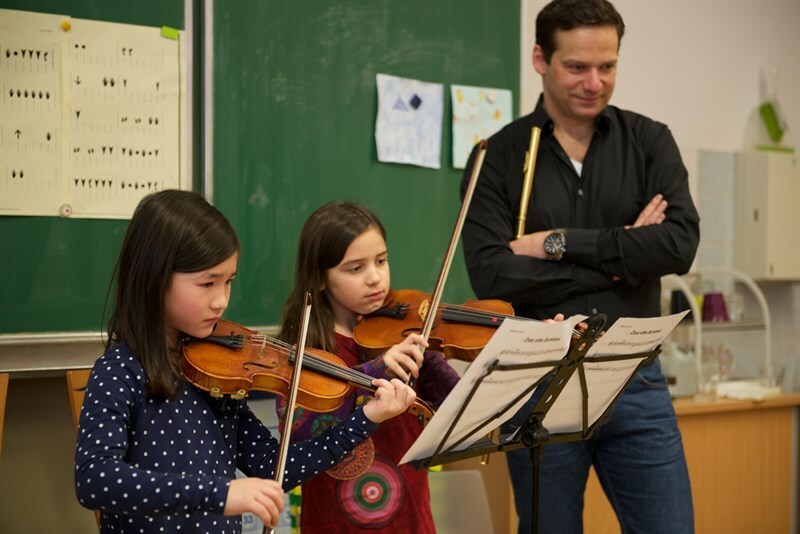 Before visiting a rehearsal or dress rehearsal, the students, together with members of the Vienna Philharmonic, explore a piece of music and its background through their own participation. In order to sharpen the auditory experience, instruments, voice and body are used in various ways. A distinctive motive from the composition might be reduced to its essence, for example, in order that the class can learn to play it themselves and recognize it when at the rehearsal. Teachers are also provided with instructive material which helps them to prepare the students for the workshop.